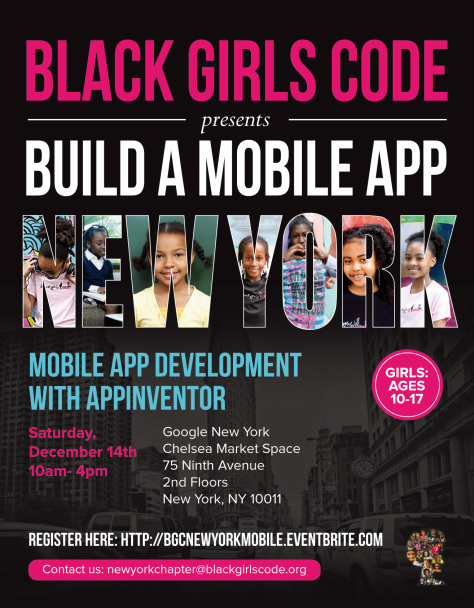 This workshop will focus on mobile app development with Android AppInventor and feature exciting “tech chats” from inspiring women mobile innovators. AppInventor is a fun and simple tool that allows our young code divas to create their own mobile apps using drag-and-drop the programming blocks similar to a puzzle to make the user interface and program. It’s that easy. You can learn how to write music apps, apps that tell your fortune, and more. Never wonder again if there’s an app for that, because you’ll be able to create your own! No prior programming experience is required for this class. All BGC events are geared towards introducing participants to the technological universe and encouraging them to pursue careers as Tech Creators and Entrepreneurs. This ciass intended for girls ages 10-17.